Food preservation has been a necessity for survival from the beginning of time and is a testimony to the ingenuity of people. In ancient times many forms of natural preservation were used. Food could be frozen in areas where temperatures dropped below freezing for the winter months. In warm climates the sun and wind were used to dry food. To preserve food at above freezing temperatures, caves, root cellars, buried caches and the like were used. 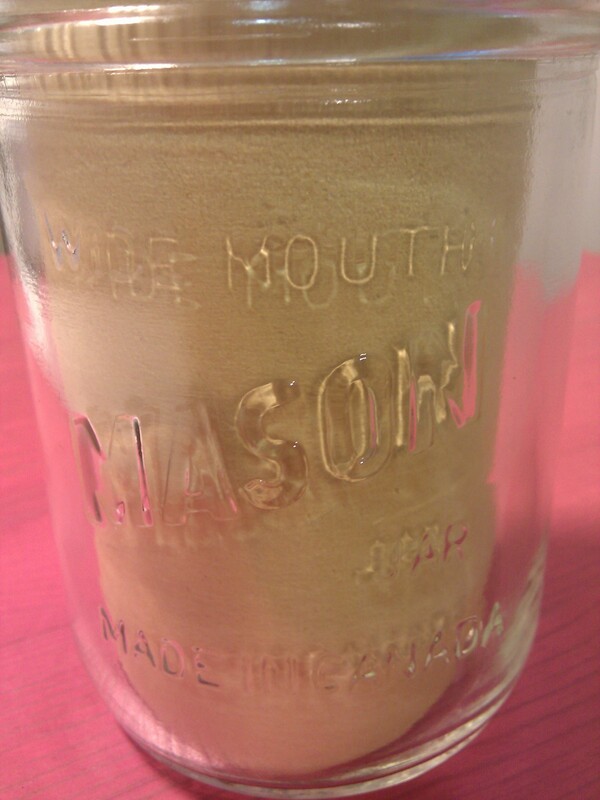 As various chemicals were discovered and chemical reactions were noticed, salt, smoke, oil or fat, and fermentation were added to the preservation repertoire. Later sugar, vinegar and alcohol were used as preservatives. In British Columbia, food preservation methods depended on the climatic zone. First Nations people were able to freeze (northern BC), some were able to wind-dry (Fraser Canyon and South Okanagan), some were able to smoke and dry food (along the Pacific coast), and so on. Often they shared their methods with the settlers. For example, Ethel R. Wright in the British Columbia Women’s Institutes Centennial Cookbook (1958) describes how pioneer women watched First Nations women and “learned to smoke and dry fish and meat, by placing it on willow racks above a fire..[and how] to dry berries” (p. 57). On the homestead our year had five seasons. The fifth season was the time for canning, drying, pickling, and preserving the food supply for the winter. Cabbage was shredded, and layered with coarse salt in crocks to turn into sauerkraut. My mother also did green beans and corn the same way. Quart sealers of wild blueberries, raspberries, and saskatoons were put up. 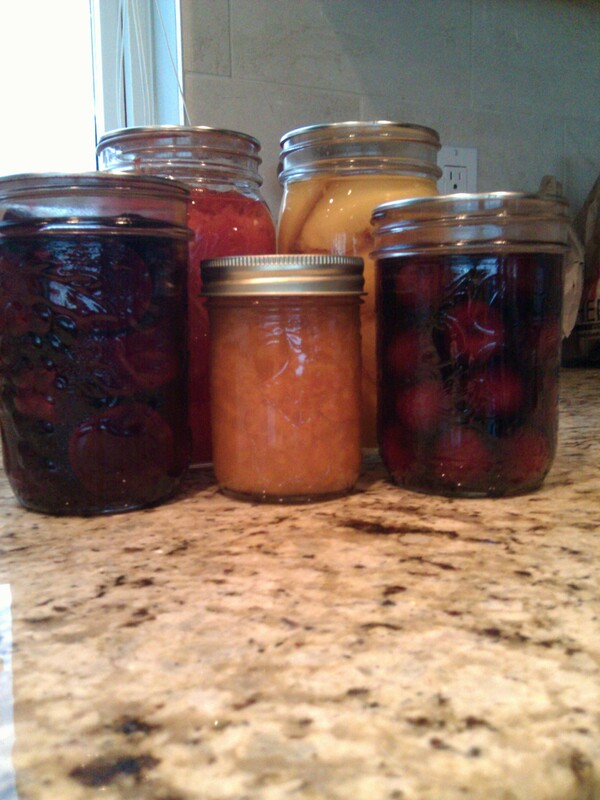 We made jelly and jam from the cranberries and chokecherries, sometimes adding rhubarb or crab apple to them. The dill pickles were put in crocks and the beet pickles into sealers. Butter was packed in jars, and a brine was poured over the top to keep it fresh. The peas were dried in the sun on an old clean sugar sack. We beat off the pods and stored the peas in sacks to be used for “baked peas”. The green beans had their ends nipped off and were strung on a thread across the kitchen to dry before being packed away in sacks. The concept of preserving foods by cooking them and sealing them in a container is very old, but sealing methods were not very reliable. 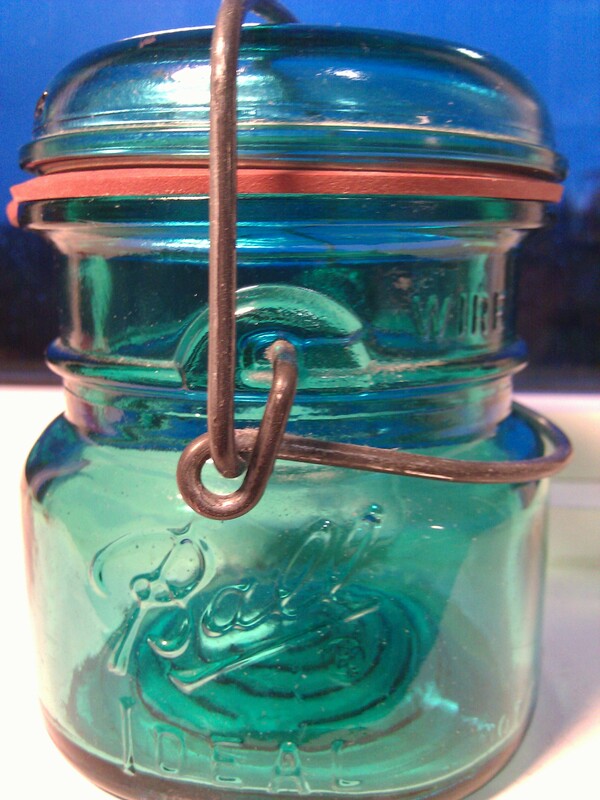 Pioneer methods for making jars for canning indicate great ingenuity and likelihood of failure: “Jars were made from bottles – a piece of wool was tied around the neck, soaked in coal oil and then burned off and the bottle was then thrust in cold water, and off came the neck, leaving a fine jam jar. The jars were sealed with a round of white paper dipped in brandy, then with a larger round dipped in white of egg which dried and made an air tight cover” (Wright, 1958, p. 57). The age of modern canning techniques dawned in 1809 when French chemist Nicolas Appert successfully used sealed glass jars, the contents of which had been thoroughly cooked in a water bath, to create portable and potable food. But it was not until 1864 when Louis Pasteur discovered the relationship between microorganisms and food spoilage/illness that the process was understood. The boiling temperature and acidic nature of food made the boiling water bath process safe for acid foods but the risk of deadly food poisoning in processing low acid food such as vegetables, meat, fish, poultry, etc. was very high. In the early 18th century a French physicist and mathematician named Denis Papin invented a machine he called a digester that could achieve temperatures higher than boiling. Later the machine was perfected and a pressure retort (canner) was patented. 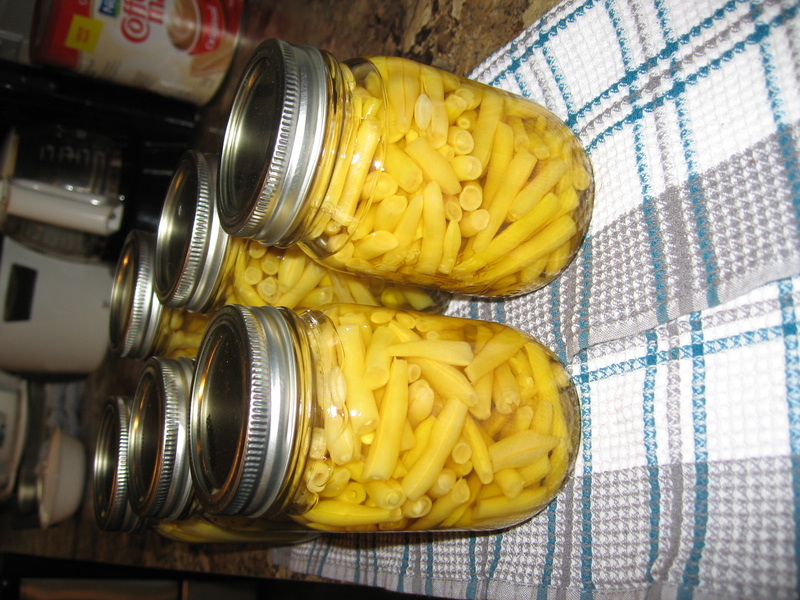 It was not until the 1920s that the significance of this method regarding the deadly bacteria Clostridium botulinum was recognized and pressure canning became the only safe method for canning low-acid foods. C. botulinum bacteria are heat-resistant, can survive boiling temperatures, and can grow in a moist, oxygen-free environment. Home canning provides the perfect conditions for this bacteria to multiply and produce the toxins that are potentially fatal. Therefore proper processing is essential. The invention of the pressure canner and improvements in jars and vacuum sealing lids have made home canning much safer and more efficient. In 1882, Henry William Putnam of Bennington, Vermont, invented a fruit jar that used a glass lid and a metal clamp to hold the lid in place. Many of these jars are still around and they are sold today for decorative purposes that specifically state “not for home canning”. 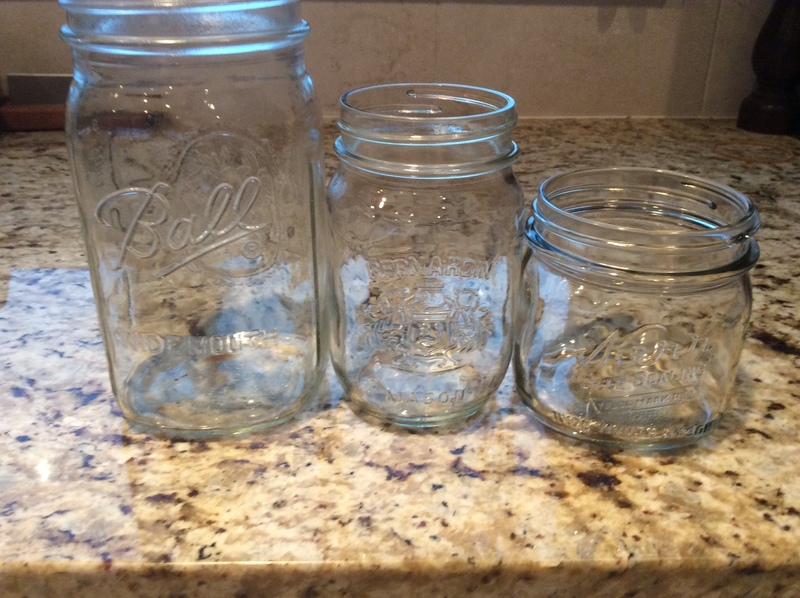 Ball, Kerr and Bernardin jars are all made in the United States but you might find a few Mason jars made in Canada similar to this one below. 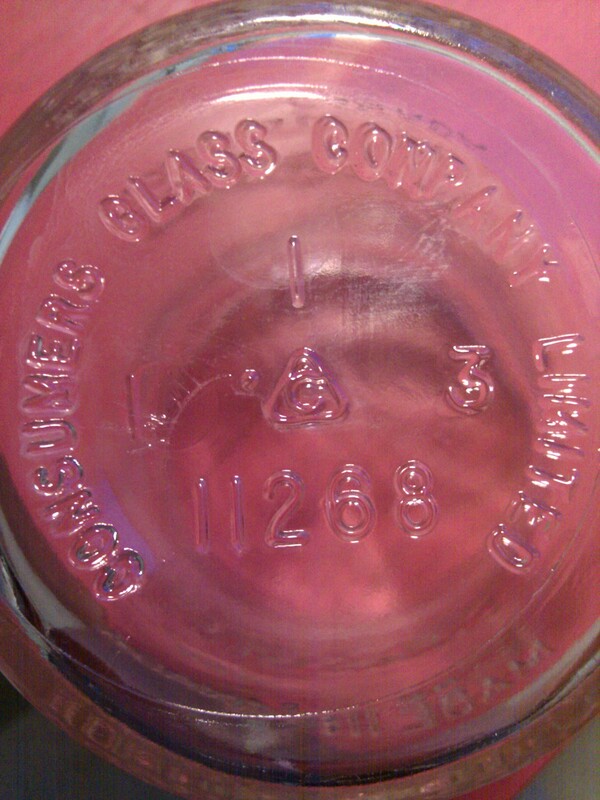 It is made by Consumers Glass Company. By decoding the information on the bottom, according to Lockhard (2014), this jar was made in Lavington, BC (dot to the left of the logo) in January/February (single vertical line) 1973 (3 to the right of the logo). A breakthrough in home canning came when a man named Landsberger from San Francisco developed the idea of a metal lid with a permanently attached gasket. Alexander Kerr used this idea to create a metal disk with a gasket that could be held in place by a screw on ring and the modern canning lid was born. Ball also began to produce lids like this. 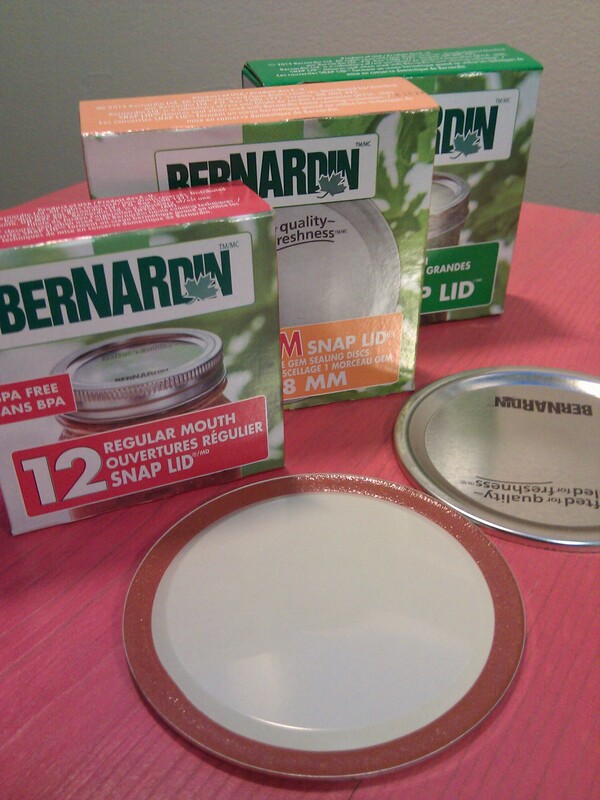 Now the most common brand available in Canada is Bernardin. Boiling water bath canning is safe only for acid foods (most fruits, tomatoes, pickles). Pressure canning is a must for all low acid foods (vegetables, meat, fish, poultry, soups, stews). Processing methods and times are constantly being revised and updated based on current research. Currently, it is recommended that tomatoes which have been previously classified as an acid food and can be processed in a boiling water canner be acidified (add lemon juice or vinegar to the jar to ensure sufficient acidity). Cold pack tomatoes (canned using the swish method where raw tomatoes are placed in the jar and then swished until they are covered in their own juice) need to be processed in a boiling water bath canner for 85 minutes not the 35 minutes often mentioned in older publications. Jam and jellies should be put into Mason jars with lids and rings and vacuum sealed in a boiling water bath canner for 10 minutes (no more wax). Pumpkin which is low acid should be pressure canned but in chunks covered with water. Pumpkin puree is just too dense to safely can even using a pressure canner. When you make your pumpkin pie, you simply drain and then puree. It is best to use updated information about processing, even when using heritage recipes. 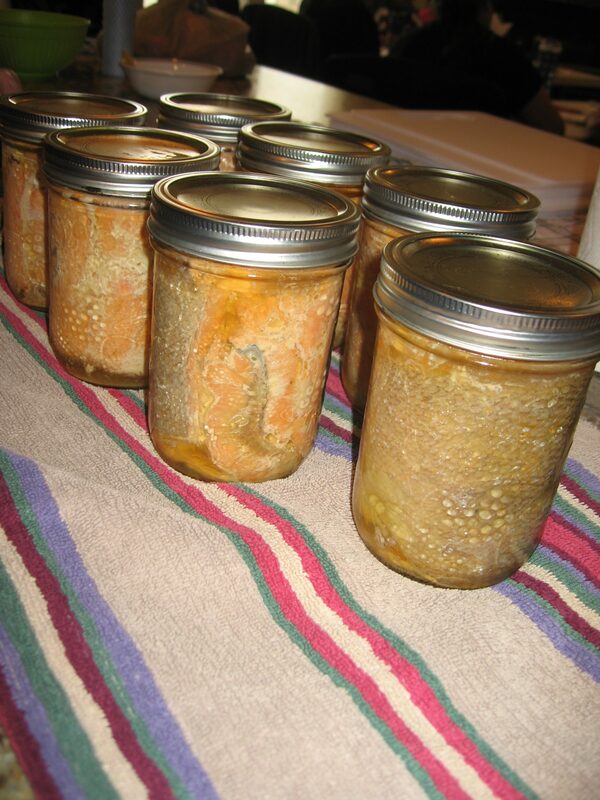 Some historians believe that food preservation was not just for survival. It also has cultural, social, and economic significance. I preserve for many reasons: to carry on the traditions of my mother and grandmothers; to be able to eat local fruits, vegetables, and fish out of season; to be able to control the amount of sugar, salt and additional ingredients; just for the pure enjoyment and satisfaction of preserving my own food; and to enjoy the company of others when we can together. There is nothing better than serving home made pickles, or pies made from canned cherry pie filling, or peach upside down cake made with your own canned peaches, or slathering home made huckleberry jam on a fresh bagel, or making that special dish made with canned salmon, or opening a savory relish or chutney to accompany the main dish…. Bernardin (2008). Bernardin guide to home preserving. Canada: Bernardin Ltd.
Hart-Davis, A. (Ed.). (2012). Engineers from the Great Pyramids to the pioneers of space travel. London: DK Books. p. 106. (Denis Papin). Health Canada. Botulism (Clostridium botulinum). Health Canada. 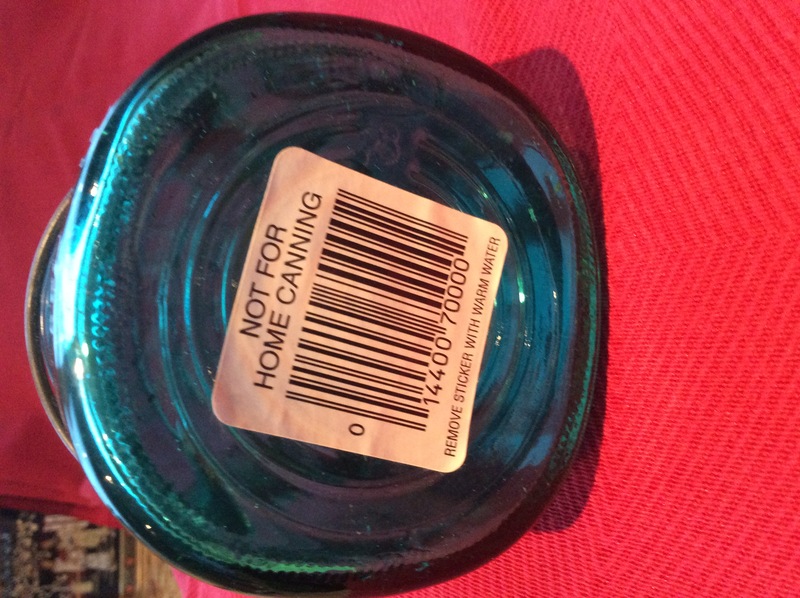 Home canning safety. Wright, E. R. (1958). Home Economics. British Columbia Women’s Institutes Centennial Cook Book (pp. 56-58), Vancouver, Canada: Mitchell Press.